Fried rice with shrimp paste is a traditional Thai food. How to make it may be a little bit difficult because it has a lot of ingredients. It has quite a few side dishes which will mean it takes a while to make everything, but it is so worth it. Luckily, all the ingredients are easy to find anywhere. The characteristic of fried rice with shrimp paste is light in color, has the taste of shrimp paste and very fragrant. The shrimp paste that we use has to be the good shrimp paste, it should be not very salty and not too dark in color. For the rice, you have to use old Jasmine rice (as opposed to new crop rice) and less water to cook because when the rice is cooked it should not come out too wet and it stays in the whole beautiful grain after cooking. In the past Thai people liked to wrap shrimp paste with banana leaves. Then grill the shrimp paste wrap to make it more fragrant before mixing it with the cooked rice. Currently this is changing, instead people will put the shrimp paste into the pan that already has golden brown garlic in it, mixing the two ingredients together and then add the rice to mix. The important sides of fried rice with shrimp paste that we can’t miss are fried dried shrimps, sweet pork, shredded omelet, thinly sliced shallots, thinly sliced chili, young mango, coriander, lime juice and cucumber. It’s totally your option which sides you add and you can certainly leave some out if they are not to your taste. 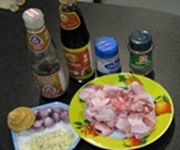 Below are the details for making fried rice with shrimp paste on your own at home. 1. 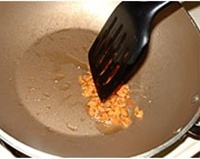 Melt shrimp paste with water. 2. Heat the oil in the pan over medium high heat. When the oil is hot then add the chopped garlic. Fry garlic until yellow brown and fragrant. 3. Add the melted shrimp paste to mix with fried garlic. 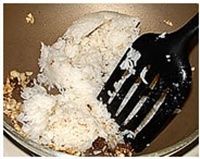 Add the rice (divided into 2 parts, it will make it easier to mix the rice with the shrimp paste). 4. Stir rice and shrimp paste well, turn off the stove and set aside. 3 long yard beans (in this case I will be using green bean instead because they taste the same and easier to find). 2 tbsp chopped raw mango or 1 small green apple (in Thailand, we will use raw mango, once again I can’t purchase raw mangoes in the U.S. so I decided to use green apple that have the similar flavor instead). 1. 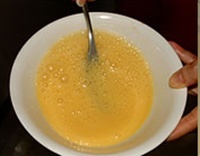 Break the eggs, and beat well (do not beat until it is full) add soy sauce and beat well together again. 2. Put the pan over high heat. 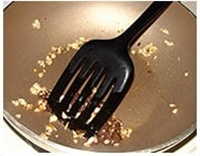 Add 1/2 Tbsp oil into the pan. Roll the pan around for the oil to coat the pan. When the pan is hot, pour eggs into the pan. 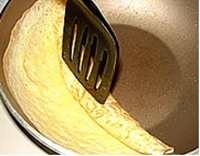 Quickly tilt the pan around until the egg coats over the oily pan. 2. Leave it until the edge of the egg starts to peel off the pan easily. Then start to roll the egg out of the pan and put the rolled egg on the dish. 3. Cut the rolled eggs into the shreds (julienne style) and set it aside. Cut sausage on the oblique into 1 inch long pieces. Put the pan over medium heat. 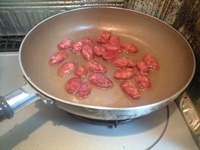 Heat 2 Tbsp oil, and when it’s hot then fry the prepared sausages until they start to turn dark brown. Put it on the paper towel to absorb the extra oil. Set the pan over medium heat. 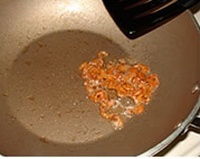 Heat 1 Tbsp of oil until it is hot then start to fry the dried shrimp. When the shrimp turns brown take it out and put it on the paper towel to absorb the extra oil. 1. Peel the shallots, take the stem off the chili, and wash them with water thoroughly. Slice the shallots into thin pieces and chop the chili into the small pieces. Slice the lime into quarters and set them aside. 2. Wash apple and green beans thoroughly. Peel off the green apple skin and slice thinly. Then soak them in cold water mixed with ½ tsp of salt for about 5 minutes. Rinse them with water again and drain the water out (this will help to prevent the apple from turning black). 3. Cucumber, washed, peeled, and cut into oblique pieces. Green beans, washed and cut the edge of both sides off. Then chop into small pieces. Put vegetables on the plate with the other side dishes. Prepare for serving. 1. Wash the fresh pork side thoroughly. Try to select the meat part over the fat part. 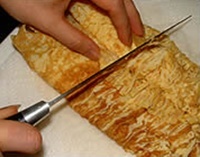 Cut into a small and thin pieces. 2. Heat the oil in the wok over medium heat. Fry shallots until they turn yellow brown and take them out from the wok. 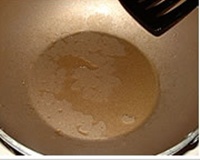 Save the remaining oil from frying in the wok. 3. Add the sliced fresh pork side into the wok (that already has oil in it). Cook the pork for a few minutes. Add water into the wok and wait until it boils. When the water starts to boil then season with black soy sauce, soy sauce and the seasoning sauce. 4. 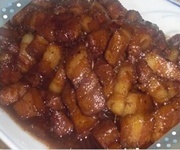 When the pork starts to get soft and the liquid is reduced by half, then add palm sugar. 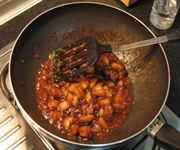 Mix and stir until the palm sugar dissolves and becomes dry, brown and sticky for another 15 minutes. Then add fried shallots, stir and put them into a bowl. Hold for serving. Tip: Palm sugar should be put it later from the other ingredients. If you add the palm sugar too early it will tighten up the pork and make the pork get so solid. 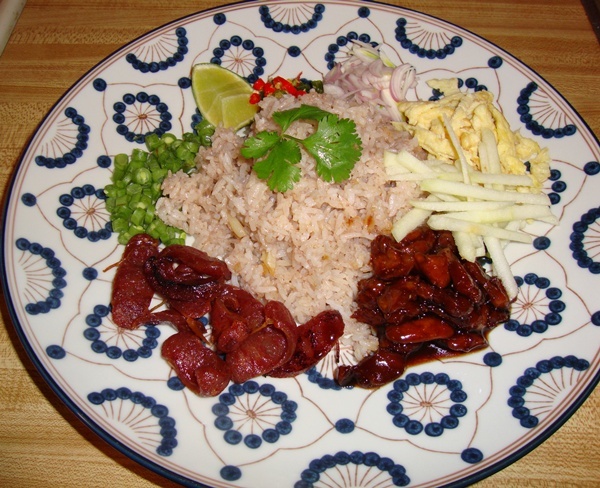 Place the fried rice with shrimp paste on the plate. 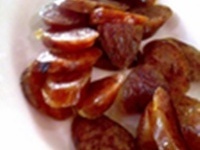 Place the side dishes including eggs, fried sausage, fried dried shrimp, shredded apple, sliced shallot, chopped green bean. 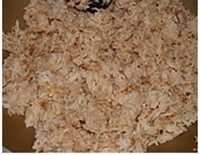 For the sweet pork can serve separate in a small bowl or put on top of the rice depends on your preference. Then serve.